After much anticipation, international luxury lifestyle hotel SO/ Auckland has removed the bollards and rolled out the red carpet, welcoming guests and nosy neighbours to eat, drink, stay and play in the heart of the city.Renowned Kiwi fashion innovator WORLD has provided flair throughout the hotel as the signature design partner for this very individual, designer lifestyle hotel. 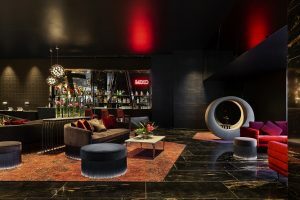 WORLD’s influence includes the hotel’s bold emblem design, which reflects the volcanic history of Auckland, the natural beauty of New Zealand and the history of the building itself. 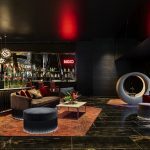 “We’re ecstatic to finally open the doors to Auckland’s most audacious hotel,” said SO/ Auckland General Manager Stephen Gould. “It’s been an exciting journey with the global SO team since 2011 to prepare for opening including two years of immersion with the brand at SO/ Bangkok. Every touch of a SO/ hotel is unique to its location and thanks in large part to our signature designer WORLD, we have unlocked a destination truly unique to our shores,” he said. Following in the line-up of celebrated fashion designers, WORLD joins an international stable that includes Mr. Kenzo Takada in Mauritius, Monsieur Christian Lacroix in Bangkok and Viktor&Rolf in Berlin. An obvious fit for the hotel due to their bold, energetic, playful style, WORLD’s touch can be seen in everything from the staff ‘attire’, wallpaper, suite artwork, neon art installations and, most importantly, the hotel’s unique emblem. Furniture and lighting installations by Dutch design house, Moooi delight throughout the hotel. Most spectacularly, Mixo Bar on the ground floor entrance is home to the hotel world’s first Mega Chandelier created by Marcel Wanders. The HI-SO rooftop bar, with expansive views of the Waitemata Harbour and Rangitoto Island, is set to transform the way Kiwis and visitors socialise this summer. 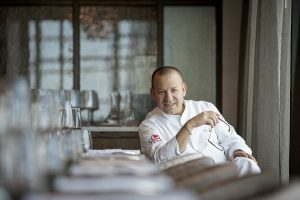 A feat for New Zealand’s already bursting culinary scene, SO/ Auckland’s Harbour Society restaurant on the 15th floor is home to French Chef Marc De Passorio, former owner of Michelin-starred restaurant, L’Esprit de la Violette. Marc sold L’Esprit de la Violette and jumped at the chance to make Auckland his next culinary home. And what’s a designer hotel without the most indulgent of spas? SO/ Spa is bringing the big guns (and potions) to answer all beauty, wellness and relaxation prayers. With innovative offerings like Himalayan detox therapy, Tibetan sound healing, chakra balancing and peeling Chlorella masks, there is something to relax and revitalise every type of spa goer. Whether it is a quick morning-after eye treatment or combatting jetlag, there are spa treatments aplenty. Rates begin from $469NZD per room per night and each of the hotel’s 130-rooms includes its own luxurious bath, an abundance of natural light, a separate rain-shower, on-demand, in room technology, complimentary non-alcoholic mini bar and Wi-Fi, a flat screen TV and a choice of harbour or city views. Harbour view rooms also have outdoor balcony access.